I got two replicas of John Webber prints. I thought that they might maybe be actual Webber prints but it turned out that they weren't. In any case, they are nice prints. 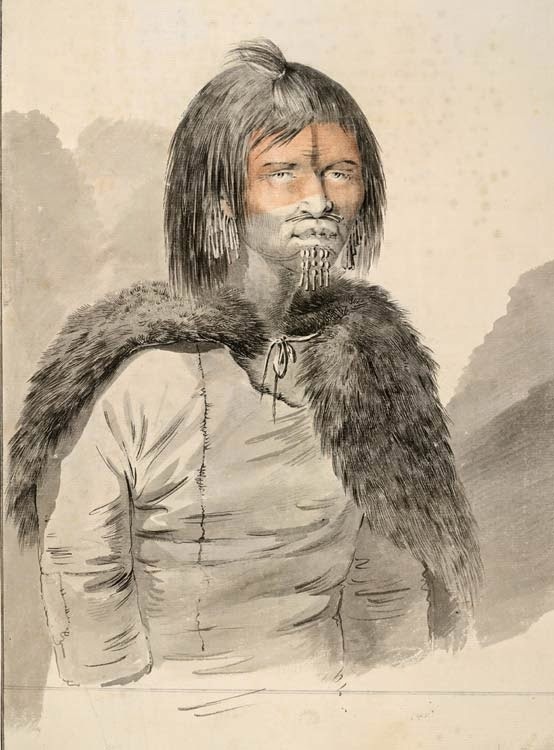 John Webber was the expedition artist for Captain Cook's voyage of discovery in the North Pacific. 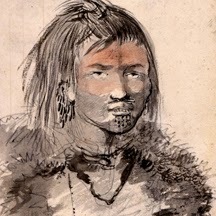 John Webber did sketches of landscapes and local people they encountered. These sketches were later taken by engravers and turned into etchings that could be printed and brought to the attention of a wider audience. The first print reproduction I got is called A Woman of Prince William's Sound now called Prince William Sound without the 's after William. Probably nobody outside of Alaska can find Prince William Sound on a map but if you're curious use your google. The only reason anyone may have heard of Prince William Sound it is because the Exxon Valdez oil tanker ran aground there and spilled oil all over the bay thereby impoverishing local fisheries and ensuring decades of work for Exxon lawyers. But that was a little over two hundred years after Captain Cook visited there. 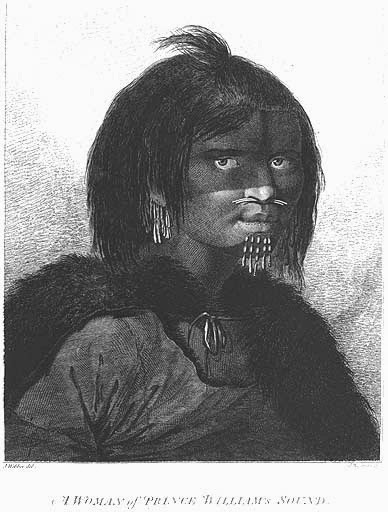 When Captain Cook visited, the primary residents of the Sound were the Chugach people. 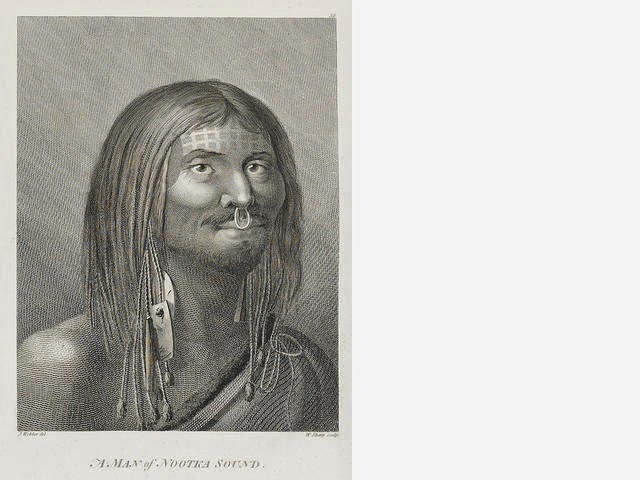 And as you can see from the print, the people of the time adorned themselves with piercings, hair weaves and tattoos much as the people of today. 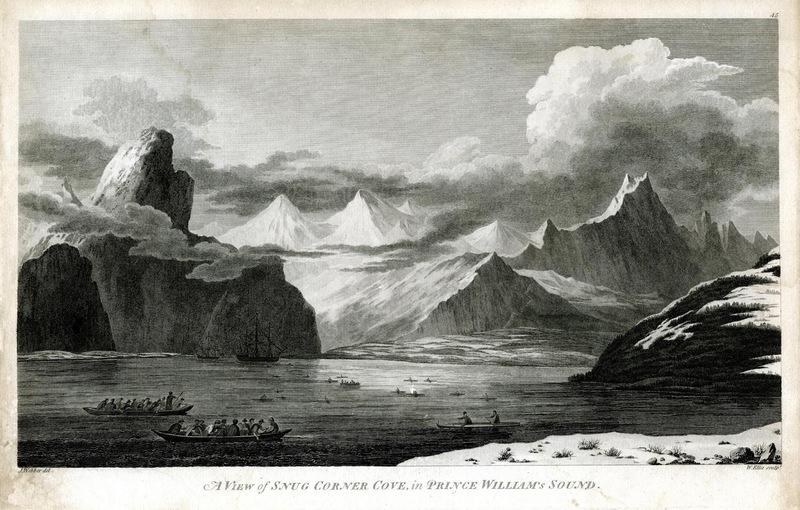 The picture above shows Prince William Sound as it looked during Cook's visit. Toward the back is Cook's ship. In the left foreground are Cook's people in wooden boats. And in the foreground just to the right of center you can see a two-man kayak. You can take my word for this or you can click on the image above to see a larger version.The kayaks paddled by the Chugach people were similar to the kayaks of the Unangan people farther to the southwest. The Russians made no distinction between the Chugach and the Unangan people and referred to all of them as Aleuts. And they called their kayaks baidarkas. The other print I got was of the Man of Nootka Sound. Nootka Sound is on the west coast of Vancouver Island some distance south of Prince William Sound. People there likewise adorned themselves in modern fashion but paddled wooden dugout canoes instead of kayaks. The drawing above and the one below are the Webber originals. These are what the engravers used to base their engravings on.